Sir Peter Bottomley today told the Daily Mail that police may need to be involved in the ground rent scandal that involves the country’s largest developers. Described as a “crackdown on sales of toxic leasehold homes”, the article also quotes Sajif Javid, the DCLG Secretary of State, calling the practices “practically feudal”. Nationwide has declared that the “maximum acceptable” ground rent for a property on which it will issue a loan in 0.1 per cent of the value. Mortgages on homes with ground rents that double every five, ten or 15 years will be refused. This is a hugely important statement, which is reverberating through the housebuilding sector. Used to being applauded by politicians for producing remarkably few new homes every year, housebuilders are reeling from the public opprobrium caused by the ground rent scandal. It now appears that through their greed and venality they have pitched thousands of homebuyers – their own customers – into properties that they cannot sell. Nationwide, and other lenders such as Barclay and HSBC, have refused mortgages on flats and houses with predatory lease terms. Bizarrely, Nationwide thinks 125 years should be the minimum length of a lease on a flat and 250 years for the lease of a house. In a statement to LKP, Nationwide could not explain why it had chosen these figures. LKP urges all leases to be indefinite, ground rent to be set to zero as it is for no service, and for flat owners to own shares in the freehold through commonhold structures – as is absolutely routine in the rest of the world outside England and Wales. Just finished reading Goldifrocks and the 3 Fairs! Hope he likes porridge! Oooh baby- I hear the little chicks coming home to roost…. The efforts of MPs during 2004-2005 in writing EDM ( early day motions) on leasehold abusers came to nothing as some MPs failed to return after General Election . We have a General Election coming up next month..
Sir Peter and the APPG should lodge a complaint with the Serious Fraud Office because their criteria for starting investigation is atleast one million pounds fraud or where a group of MPs have issues of great concern.. 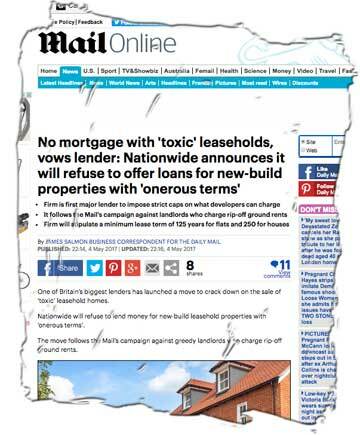 The National Newspapers can help to expose the other developers selling leasehold houses. Taylor Wimpey are setting aside £130 Mil to persuade the freeholders to reduce the ground rent . What are Persimmons , Bellway and Redrow doing about this problem.? HMRC can help to end leasehold system tomorrow by introducing VAT on the first sale of leases with ground rent more than £10 p.a during the first 80 years . “WE have been involved in a number of ground rent disposals where they were best on price and chosen as preferred bidders. They were extremely efficient and dealt with the legal work in a timely manner. Ground Rent Fund on their website offer what they term as”introduction” fees paid on all successful purchases. So who was it that gave this glowing testimony (and who benefited financially from freehold sales? Who was involved with Savilles? Who heads up the “independent” Leasehold Advisory Service? Along with the above comment from St. Peter (sic), I am also encouraged by recent statements from Gov. ministers. In a very recent reply to my own MP,, Gavin Barwell,MP, Housing Minister, confirmed “…the Government has concerns about the transparency (or lack of it) given to the way leasehold property is marketed, whether lease agreements are fair, and whether property owners and agents are acting reasonably. I have asked the Law Commission to look into this area”. Put simply, when leasehold abuse hits the pockets of leaseholders, it is fraud; and fraud on a very large scale. The abusers are from a small predatory group of landlords who for far too long have been permitted to openly and criminally flaunt their contempt for the law .The lack of any real clout in existing legislation has served only to assist the unscrupulous trampling of the gullible and vulnerable leaseholder in this vast unregulated sector of the national economy. Hopefully, thanks to Justin Madders MP, Katie, LKP et al, the scandal concerning the sale of leasehold houses will shortly come to an end. However, had existing legislation governing the sale and management of leasehold flats been enforced effectively before now, the scandal of leasehold houses would never have got off the ground in the first place! The attempt to create a new “asset class” through escalating Ground Rents would never have developed without the unscrupulous few being able to ride criminal roughshod over existing legislation governing the sale and purchase of freehold titles in leasehold flats. Emboldened by their “successes”, in the unregulated world of flatland, they considered themselves immune, and with the aid of equally unscrupulous advisers, thought they could simply extend unchecked into the new lucrative world of new houses.. Well, thankfully, they are obtaining their comeuppance and all involved in bringing this latest scandal to light deserve to take a bow. That leaves the far greater and continuing fraud: the fraudulent sale of freehold titles of leasehold premises and the fraud of the “informal” lease extension. And it is here that we must ensure the Law Commission do put this sordid trade under the microscope, as this is the “PPI” style scandal now endemic in flatland. The LTA 1987 provides that qualifying leaseholders possess the right of first refusal to purchase the landlord freehold interest in the premises should the landlord wish to sell it, or buy that same interest from the purchaser, on like terms to the original disposal, should the landlord actually sell it. The introduction of criminal penalties through the Housing Act 1996 was designed specifically to prevent landlords from ignoring this provision. It has not worked. However, it is through manipulation of sale and purchase agreements that leaseholders are kept ignorant and unaware of their statutory rights in existing legislation, and when they do realise a sale of the freehold has taken place, they are usually isolated and lack the ability to do very much about it. Enforcement of breach of right of first refusal is presently beyond the remit of the First Tier Tribunal Property and can only be achieved through the courts: a process that is financially punitive, at disproportionate cost, and open to blatant abuse through lengthy procrastination, obfuscation, and wilful breach of court procedures. by the criminal buyer. The direct intervention of the Housing Minister, Gavin Barwell MP, is much needed and welcome , and just as soon as the election is over and the Law Commission has concluded its review, we can hopefully look forward to prompt action to end these fraudulent practices once and for all across the entire sector. Alec your post is very interesting and informative ( almost on a par with St Peters!!) Your MP Gavin Barwell wrote a very dismissive letter to Katie Kendrick founder of the NLC Ignoring the concerns of the 4000 plus campaigners regarding Roger Southams appointment as LEASE Chairman. It took months for him to even acknowledge the letter. Now there is an election on………….. The government has a tendency to be in denial when it is pointed out to them that there publicly funded appointees are heavily conflicted. WHY?? Isee private eye ‘NIL BY NEWBY’ page 38..
PS. Alec I agree the ‘Ground rent portfolio ‘ scandal is a national disgrace and the crooks who perpetrate this fraud must be treated like the common criminals that they are.